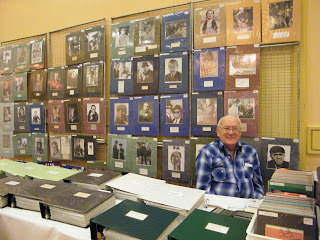 Vendor Keith Hurd offers thousands of autographs for sale! You do not need a printed invitation to attend what is quickly becoming the "destination" convention of the year. (I'm quoting Terry Salomonson, who uses that word loosely, but has attended more than 30 different conventions repeatedly over the past five years to be qualified enough to compare them all.) The seventh annual Mid-Atlantic Nostalgia Convention was a success and while everyone has their own definition of what success is... allow me to demonstrate. Last year's attendance was officially 1,490. This year we topped 2,000. Mary Ethel, Barb Davies and Mary Ann Lowe, all of whom run the front desk, gives one program guide to every paying attendee. No more, no less. By noon on Saturday, Mary Ethel informed me that she gave away the last of the program guides. We had 2,000 printed. This is a simple way of counting heads and a shock to me as we did not expect more than 25 percent growth from the previous year. "What do I do now?" she asked me. "Simple," I explained. "Just give them a wrist band (similar to an admission badge) and thank them very much for coming. There isn't anything else we can do. Mary Ann Lowe spent the morning stuffing more goody bags with program guides and promotional flyers, and with all of these dried up there was nothing else we could do. Vendors offer everything including collector cards! The wrist bands are new this year. Last year it was brought to my attention that cheap skates and gate crashers were in the hotel parking lot hoping to get free admission by asking folks exiting the hotel if they were leaving and whether or not they could hand them their admission badge. With the added security downstairs looking for wrist bands, this seems to be the ultimate solution to a problem that we will continue to face. And guess what? We still had gate crashers who managed to sneak inside without paying. And two of them were former members of convention committees so they above all else know better. Sigh... I guess we do the best we can and hope people are remain honest. Very rare and expensive comic books. Over 150 vendor tables offered everything from movie posters, lobby cards, photographs, magazines, vintage books, pulp magazines (originals and reprints), comic books, bobble heads, vhs videos, DVDs, books, vintage toys, old-time radio shows and much more. David Strebe had recently acquired a private collection of Hollywood books and was selling paperbacks at $2 and hardcovers for $3. I must have spent more than $30 on books alone -- including one I kept meaning to buy about the making of Hitchcock's Vertigo. The enclosed photos will give you an idea of the variety of merchandise available for sale at varied prices. Bill Parisho offers DVDs for bargain prices. Bobble heads for every type of character you want. Art Harvey brings so many photos you can find what you are looking for. Rick Payne displays some very impressive items. If you cannot find it, Art Harvey doesn't have it. Wow! Juan always has top-notch titles available for sale. Mike Cregar is like a kid at Christmas when he sees ???? Paperback books for bargain prices! Author C.J. Henderson displays the latest of Moonstone Books. The movie room head count verified the largest attendance in the room to date. The most popular films of the weekend were Laurel and Hardy film shorts, You Bet Your Life blooper reels with Groucho Marx, a film noir movie, The Narrow Margin (1954) and Preston Sturgess' classic, Sullivan's Travels (1942). Noralee Frankel offers a fascinating slide show. The seminars included a variety of topics so everyone was able to find something of amusement. Among the highlights were Noralee Frankel's talk about Gypsy Rose Lee. She authored a great book about the striptease artist, actress and author. Whenever stripper Gypsy Rose Lee encountered public criticism, she spoke frankly in her own defense. “Thousands have seen me at my–ah–best; and thousands have made no objections.” Noralee discussed the fabulous life and career with a slide show presentation with photographs of her as a strip tease artist, Broadway and movie star, author, activist, and talk show host. A fan poses with Academy Award winner Shirley Jones. For baseball fans, the Brooklyn Dodgers of the 1950s was magic down memory lane. A slide show presentation discussed the reasons behind the magical love affair between the Dodgers and Brooklyn, the enduring passion for the team decades after it abandoned the borough for Los Angeles in 1958 and how 1960s popular culture cemented the Dodgers’ association with Los Angeles. David Krell, author of the up-coming book, Blue Magic: The Brooklyn Dodgers, Ebbets Field and the Battle for Baseball’s Soul, opened the weekend with his presentation that received rave reviews. Gordon Shriver of Georgia, author of Boris Karloff: The Man Remembered, presented a well-spoken, well-versed essay on Boris Karloff. With so much attention on Karloff's movie career, it was nice to see someone tackling a different subject altogether: Karloff's television and Broadway career. Gordon did not just cover the New York stage but also regional theater appearances such as Peter Pan and Arsenic and Old Lace, as well as his wide-ranging work in television from the medium’s infancy. Among the highlights of the presentation are rare photos and first-hand, exclusive anecdotes from people who worked with Boris Karloff. For more information about Gord Shriver’s book, visit www.CoverOut.com. You have to be a true film buff to know of Thomas Ince. Thomas Ince is a name found in every history of silent movies, but sadly has become best remembered not for his life, but his death after a visit to the yacht of William Randolph Hearst. Film historian Brian Taves authored the first biography of Ince, based on newly-released papers, the fan and trade press, and the surviving films. His book was recently voted “Book of the Month” by Turner Classic Movies and we were honored to have Brian at the convention this year, offering his take on the life and career of Thomas Ince. Ince’s real achievements as producer of 800 films were explored as only Brian could document. Authors Chuck Harter (left) and Michael J. Hayde (right). Authors Chuck Harter and Michael J. Hayde have a new book about Harry Langdon that... well, staggers the imagination. It's the size of a phone book and is your one-stop source for everything Harry Langdon. The book premiered at the Mid-Atlantic Nostalgia Convention and thanks to Chuck and Mike, a slide show presentation with brief clips about the silent screen comedian gave us a glimpse of an actor who was also human. The Metro Washington Old-Time Radio Club had their monthly meeting held at the convention on Saturday. Members of the club who did not live in Maryland and Virginia were able to attend the meeting and witness a demonstration involving sound effects. Friday night was active with the first annual sock hop. A sock hop was an informal sponsored dance at American high schools, typically held in the high school’s own gym or cafeteria. The term sock hop came about because dancers were required to remove their shoes to protect the varnished floor of the gymnasium. These hops were a cultural feature of the 1950s and early rock and roll. The music was usually records, sometimes presented by a disc jockey. Occasionally there were also live bands. (The term record hop is generally synonymous with sock hop.) In subsequent decades, with the widespread popularity of sneakers and other types of indoors-only shoes, the practice of removing shoes was dropped and the term began to be applied more generally to any informal high school dance. Many brought their dancing shoes and fifties costumes and had a chance to relive the good ol’ days of a sock hop with music from 78s and 45s! Free snacks and sodas were available! Later that evening, fans were treated to a 3-D movie of Phantom of the Rue Morgue (1954) which was Warner Bros.' follow-up to House of Wax. A few of the folks who came in costume! On Friday evening there was a charity auction to help benefit the St. Jude Children's Hospital. It's comforting to see a lot of support as people brought items to donate for the charity auction. Original Hollywood memorabilia was auctioned off. Glossy photographs from celebrities who mailed us photographs included Jane Fonda, Burt Renyolds, Ann Blyth, Esther Williams, Barbara Eden, Rhonda Fleming and many others. Because of the untimely passing of Celeste Holm this year, the contract she signed for her 2009 appearance at the convention was also auctioned off for a good cause. While we know the auction only lasted an hour and you can only raise so much in a short time frame, we were able to raise $360 more this year than last. Last year we raised $1,200. This year we raised $1,560. Gotham Radio Players perform for a crowd. For those who enjoy old-time radio re-creations on stage, MANC attendees were treated to the talents of the Gotham Radio Players who offered us "Death Plays a Tune," a "lost" episode of The Mysterious Traveler. Their performance received a standing ovation. Mary and Don Ramlow offered us two goodies: Tarzan and a virtually unknown 1942 Hopalong Cassidy radio broadcast that no one knew even existed until a script was found this past year. Western fans who thought they heard every Hopalong Cassidy story were given a rare treat, indeed. Sound effects were performed on the table. And then there were the celebrities. Shirley Jones was wonderful with the fans, providing them an opportunity to have her photo taken with them (no doubt posted on Facebook by this time) and answering questions about The Music Man, Carousel, Oklahoma!, Elmer Gantry and The Partridge Family. She ran out of photos from The Partridge Family and convention staff did what they could to have more reproduced before the end of the day. Mel Simons interviews the leading ladies on Thursday. James Darren takes a moment for interviewer Mark J. Gross. James Darren and Robert Colbert during the Q&A on stage. James Darren and Robert Colbert participated in a Q&A session on stage about their careers, most notably The Time Tunnel (1966-67), prior to a slide show presentation about the history of the television program. A new book about The Time Tunnel was just published and premiered at the convention and Darren and Colbert signed a total of more than 300 copies before the weekend was over! Jay North and Jeanne Russell (stars of Dennis the Menace), answered questions for fans who either grew up watching the television series, saw reruns on Nick-At-Nite's TV Land or bought the recent Shout! Factory DVD releases. The beautiful Sherry Jackson talked about her screen career on Make Room for Daddy, her radio appearances in the mid-fifties (including Suspense) and appearances on such TV programs as Star Trek and Batman. Veronica Carlson from numerous Hammer horror movies talked about Peter Cushing, Christopher Lee and Roger Moore. Geri Reischel talked about The Brady Bunch. Ian Petrella talked about his appearance on A Christmas Story. William Sanderson had plenty of photos from Newhart, Deadwood and True Blood. Fans of Newhart wanted to know if he could keep the Darryls straight. Tammy Locke talked about The Monroes. Neal Ellis interviews four of the celebrities on stage. Ron Ely talked candidly about Tarzan and Doc Savage, after a late arrival. Seems the airport kept making excuses for the flight and the actor was stranded in airports for almost 36 hours. By the time he finally arrived at the hotel, Mr. Ely was unable to set up and sign autographs until Friday morning. Fans were obliging (as was the front desk for people who only paid for a Thursday admission and had to return the next day) as they lined up to get Ron Ely's autograph. Jay accepting the first annual Jay Hickerson award. The Guest of Honor this year was Jay Hickerson, founder of the Friends of Old-Time Radio Convention. Besides acting as a convention organizer for 41 years, Jay wrote a book titled The Ultimate History of Network Radio Programming and Guide to All Circulating Shows (1992). Jay issues a supplement every year in addition to the book and every four years revises the entire book with all past supplements incorporated. His contribution to the field has provided more assistance to researchers and ensured the longevity of the hobby that is seemed only fitting that the first annual Jay Hickerson award be given to Jay himself. That's right, starting 2012, the Jay Hickerson Award will be given annually to someone who contributes to the longevity and preservation of the history of nostalgic pop culture. We already have our sights on the Guest of Honor next year, as well as two confirmed celebrity guests. Four authors of critically-acclaimed books are slated to deliver slide show presentations as well. By December it appears the entire convention will be scheduled and ready for promoting. But you can do something that takes two minutes and ensures you will not miss out on the latest news about next year's event. Visit the convention website, www.MidAtlanticNostalgiaConvention.com and sign up for the free newsletter. Even if you don't think you can attend next year, visit the website for many informative articles similar in nature to the blog posts I provide and... get this... hold on to your socks tight... we'll be offering most of the slide show seminars next year and Q&A panels via live video streaming. More details to be provided. So even if you live in Alaska, England, Canada, Hawaii, etc., you can still enjoy the events. Geri Reischel (The Brady Bunch) poses with U.S. Military. Abbott and Costello performed on stage after the dinner banquet. The dinner banquet was a complete sell-out this year. Jim McQuaig, Neal Ellis and Kathy Meola from Radio Once More. Ian Petrella greets troops who attended the convention. Photos Sherry Jackson was signing for her fans. Mike performed sang and played the guitar at the Sock Hop. People were just arriving for the 3-D movie. Neal Ellis interviews Ian Petrella at the microphone. Celebrities caught on candid camera between signings. If the crowd gets larger, we'll need more convention staff. Folks gather around the celebrity tables. Photos enclosed are courtesy of Bill Guptill, Mark Gross and Gerald Yamin, as well as a number of friendly folks on Facebook. Great to see friends like Jay, Neal, and the Gothamites there. Hope to make it sometime, as both fan and actor.